Alex Harvey of St-Ferreol-les-Neiges, Que. bursts into tears after finishing second in the men's 15-kilometre mass start classic race on Saturday. It would have been difficult to top the triumphant silver medal from the previous day, but Canada’s Alex Harvey still capped his storied cross-country ski career in style Sunday with a second-place finish in the 15-kilometre pursuit at the World Cup Finals. A huge throng of fans flocked to a sunny but windy Plains of Abraham to watch the local favourite end his remarkable reign as Canada’s top competitor in the sport. Some cheered and held signs saying “One More Year.” But after the race, the 30-year-old Harvey was firm about plans to retire after 10 years of competition. 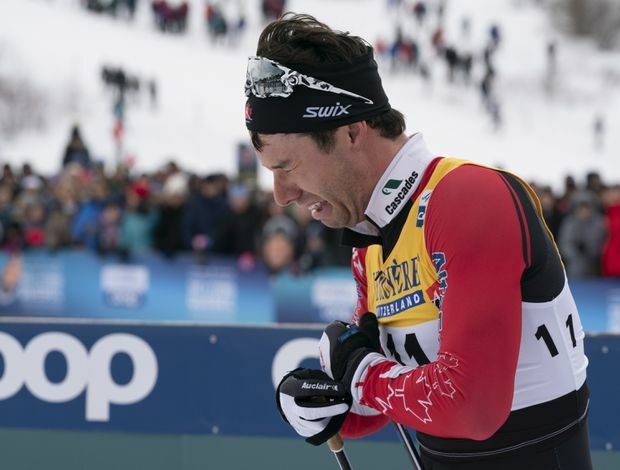 Harvey was 10th in Friday’s sprint and thrilled supporters with a second-place showing in the 15K classic-ski mass start Saturday, a result that left him in tears on the podium. The silver on Sunday was the 32nd career World Cup medal for the three-time Olympian, but only his third podium finish in a challenging 2018-19 season. Harvey gave credit to the crowd for elevating his performance. “It made a huge difference, especially yesterday actually, but today as well,” Harvey said Sunday. “Today I was starting with a big advantage over the other guys so I had a really good chance to make the podium. At the end of a season like that everybody’s really tired. Harvey, from Saint-Ferreol-des-Neiges, Que., finished less than three seconds behind Norwegian Johannes Klaebo and just ahead of Russian Alexander Bolshunov in a hard push to the finish line. The trio led from the start, with Harvey and Bolshunov hanging back behind Klaebo until the final sprint. Harvey said his main strategy was to stick close to the Russian. “The Russians don’t like to follow so it’s pretty easy,” he said. Toronto’s Len Valjas was 38th. The 30-year-old has also announced his retirement from competition. In the women’s 10K pursuit, Sweden’s Stina Nilsson stormed out to an early lead and never looked back. Norwegian Therese Johaug was 12 seconds behind in second and compatriot Ingvild Oestberg was just behind in third. Nilsson swept the three events in Quebec City. Emily Nishikawa of Whitehorse was 31st. Harvey, who finished fourth in the 50K at the Pyeongchang Games last year, said he hopes to be involved in developing the next generation of Canadian cross-country ski talent. He’s also studying law at Laval University and will be getting married in June. Harvey said it was a dream way to finish his career.